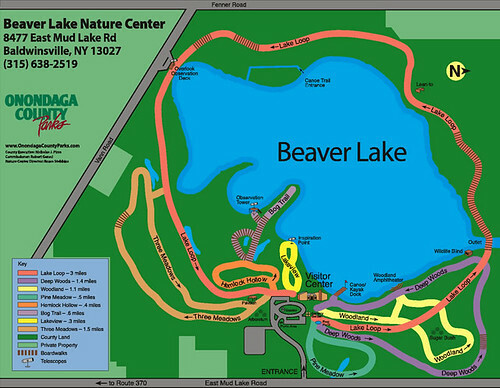 Plunge into the world of Beaver Lake Nature Center. The Nature Center offers over 400 annual programs. A rich mix of habitats creates the possibility of seeing more than 200 species of birds and over 800 varieties of plants. Its winding trails are to be enjoyed in all seasons. The 200 acre glacial lake is a migratory stop for thousands of Canada geese that migrate through, as well as an opportunity for summertime exploration by canoe. Admission is dirt cheap– only $2 for a vehicle. There’s a small nature center where kids can explore. There’s a canoe dock for canoes and kayaks. There’s also a playground, picnic area, and heavily-wooded trails, which are the best! Be sure to bring cameras and binoculars– views of the wildlife are stunning. I captured a small map of the park. The neat thing is that the park is open year ’round, a novelty in New York State. This is a GREAT place to see during chilly autumn– no bugs! Which reminds me– if you go before frost, bring bug spray, and lots of it. Sounds like a great lake outing place! I left a surprise for you on my blog! That sounds lovely! I’ve been to Stony Brook and Letchworth, but not Beaver Lake. Just a beautiful area – I’d love to live there again! I hope you can get there when the leaves are changing. I love the bog trail in the fall.